When I was a child I thought that Shrove Tuesday was an English tradition. It certainly didn't seem very Scottish, we ate 'pancakes' all year round, the nice, fat ones spread with butter and/or jam. But those big flat pancakes did not feature much in our lives. Of course, I now know that it is a world-wide Christian festival designed to use up all the rich and fatty foods before Lent begins. It is Mardi Gras or Fat Tuesday, the day before Ash Wednesday. "Unlike the Old Testament, however, the New Testament does not prescribe a church calendar. Furthermore, Lent became associated in the medieval church with all sorts of rules and superstitions. For the most part, the Protestant Reformers continued to celebrate Lent, but in a more evangelical way. They inveighed against the connection between fasting and penance “as a work of merit or a form of divine worship,” as Calvin put it. Lent is still celebrated today in Lutheran, Anglican, and many Reformed churches. There are of course many Scots of different denominations and churches who do and did celebrate Lent, but as a child it was not something I was aware of. Fortunately, there is no reason why you need a special day to eat pancakes, but Shrove Tuesday is a good reminder of what a tasty, quick bread a pancake can be. Measure, add, mix and pour ingredients for pancakes, muffins, cakes and more in the OXO Good Grips Batter Bowl. Bright red, permanent measurement markings are easy to read, even with thick batters. A soft, comfortable grip cushions your hand while mixing and pouring. High side walls prevent splatter, even when used with an electric mixer, and a wide lip and pour spout allow for easy, drip-free pouring. 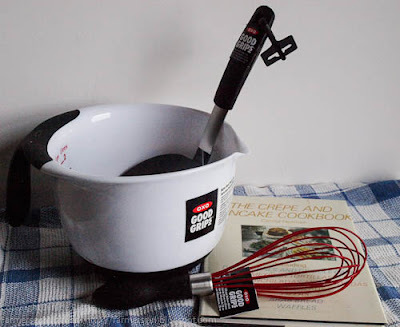 The Batter Bowl has a generous capacity of 8 cups/2 litres. The rubber base is great for stability when you are mixing and it cleans up a treat in the dishwasher. The OXO Good Grips 11” Silicone Balloon Whisk features heat resistant silicone (up to 600oF/315oC) and a teardrop shaped handle that fits comfortably in the palm of your hand. The soft handle won’t slip out of your hand, even when wet. Beat eggs, stir batter, whip cream and stir sauces in comfort. The Silicone will not discolour, warp or melt and is safe for non-stick, ceramic and metal cookware. 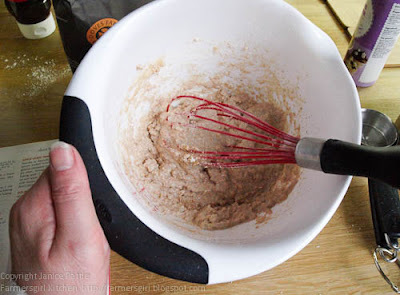 This worked really well, whipping up the eggs and batter easily, it also washes easily both by hand and in the dishwasher. The OXO Good Grips Silicone Flexible Pancake Turner combines the strength of stainless steel with the advantages of silicone. The silicone outer layer, which is heat resistant to 315ºC/600ºF and safe for non-stick cookware, is bonded to a flexible stainless steel core for added stability. The Turners have thin, flexible edges that glide easily beneath all foods and are perfect for flipping fragile foods while keeping them intact. The Pancake Turner is generous in size and easily flips pancakes, burgers and more. All Silicone Flexible Turners have soft, comfortable, non-slip grips and are the perfect companions to non-stick cookware and bakeware. This is a genius tool, your pancake is safe and easy to flip over with this wide spatula, excellent! I've had the Crepe and Pancake book by Cecilia Norman, shown in the photo (now out of print) for many years, but in the end I decided to make breakfast pancakes which are more of an American and Canadian tradition. So I turned to Betty Crocker for inspiration, then made some changes! 1. 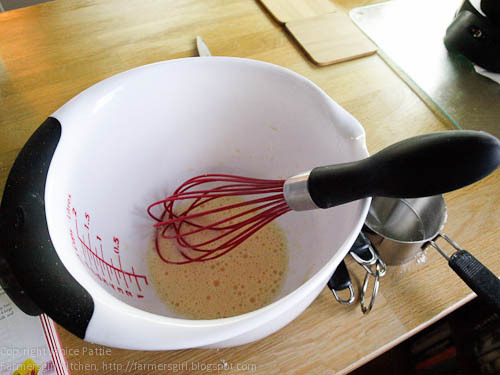 In your OXO Good Grips Batter Bowl, beat egg with the OXO Good Grips Silcone Balloon Whisk until fluffy. 2. Beat in the remaining ingredients until smooth. 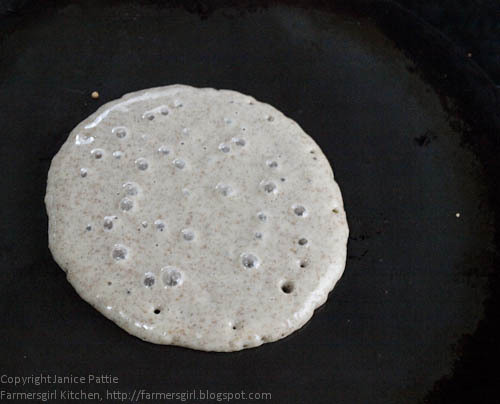 For thinner pancakes, stir in 1 or 2 additional tablespoons of milk. 3. Heat the griddle or skillet over medium heat or to 375F, if you have an electric griddle. Here is a short video clip to show you how to make your pancakes on a griddle and how to tell when they are ready. 4. 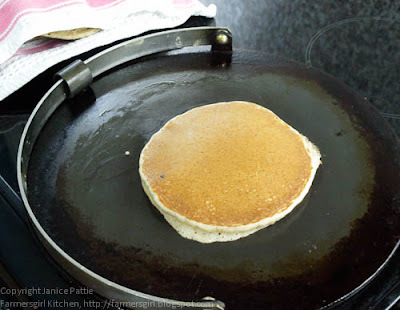 Grease the griddle with a butter paper or vegetable oil. 5. Pour or ladle the batter on to the griddle. 6. Cook pancakes until bubbly on top, puffed up and dry around the edges. 7. Turn and cook on the other side until golden brown. I made up my batter the night before although that isn't necessary, it just saved me some time in the morning. I did need to add a bit more milk as the mix had thickened up quite a lot overnight. 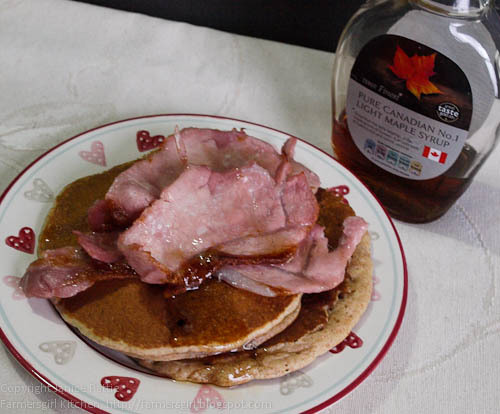 I served the pancakes with grilled Farmison back bacon and maple syrup. The bacon was amazing, the fat crisps up the way it should do and the bacon tastes delicious and meaty. The spelt pancakes were also a triumph. 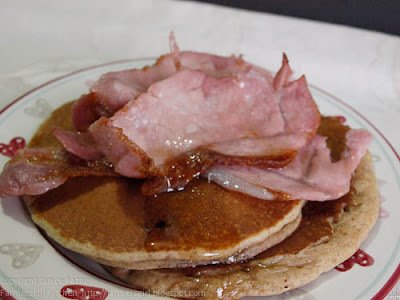 I like pancakes but they sometimes taste of nothing very much, just a base for toppings. These pelt flour pancakes had a nutty taste, but were not in the least bit heavy. I would recommend them and will be making them again. As this is a cooked breakfast I will be linking it up to the Breakfast Club linky. 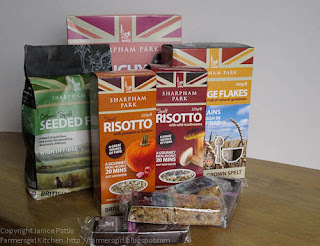 I'm hosting Breakfast Club this month for Helen at Fuss Free Flavours, the Linky is open until 24th February and everyone who enters a dish which is cooked or baked and suitable for breakfast, will also be entered into a prize draw for a hamper from the lovely people at Sharpham Park. They sent me some great samples to try and there is a breakfast hamper for the winner. 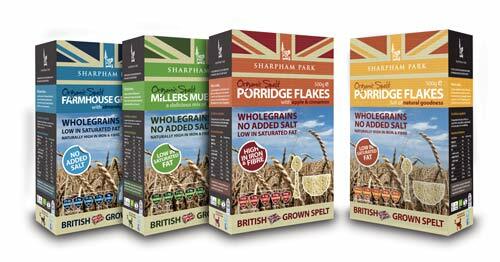 I think I may become rather evangelistic about spelt products! I really really like that batter bowl with the measurements printed inside it. Jacqueline - a trip to Vegas, that would be nice. US breakfasts are the best! Helen - You should post them up and add to Breakfast Club! Galina - don't want to tempt you too much, please do enter Breakfast Club. Ooo this looks yummy - I've never tried the whole bacon and maple syrup thing but I think I'll have to have a go soon!